A gripping ya crossover series from a spectacular new voice in the genre destroyer. Death bringer. Dragon-slayer. I am more weapon than girl. Asha is a dragon-slayer. Reviled by the very people she's sworn to protect, she kills to atone for the wicked deed she committed as a child - one that almost destroyed her city, and left her with a terrible scar. But protecting her father's kingdom is a lonely destiny: no matter how many dragons she kills, her people still think she's wicked. So to unite the fractured kingdom, she must marry jarek, her father's cruel commandant. As the wedding day approaches, asha longs for freedom. Just when it seems her fate is sealed, the king offers her a way out: her freedom in exchange for the head of the most powerful dragon in firgaard. And the only person standing in her way is a defiant slave boy...The last namsara is an extraordinary story about courage, loyalty and star-crossed love, set in a kingdom that trembles on the edge of war. Kristen Ciccarelli hails from Ontario's Niagara Peninsula where she grew up on her grandfather's grape farm. She's made her living as a baker, a bookseller, and a potter, but now writes books about bloodthirsty dragons, girls wielding really cool weapons, and the transformative power of stories. You can learn more at www. 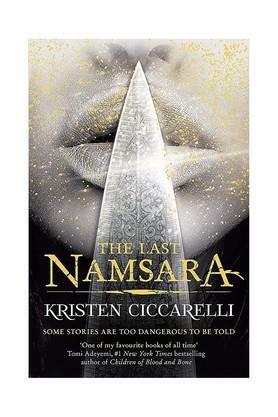 kristenciccarelli. com or by following @twocentsparrow.